Ponds can lose at least seven inches of water a week due to evaporation. Therefore, it is important to regularly replace pond water. 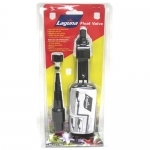 With the Laguna Float Valve, you no longer have to worry about having to top off your pond - the Float Valve does it automatically. Simply attach a regular garden hose to the Float Valve and place it at the surface of the pond. Its unique design will automatically allow water from the garden hose to flow into the pond when the water level is lower than desired. Adjustable to various settings (allows the water level to be kept at the depth required). Comes complete with a multi-hose adapter 1/4 in to 3/4 in (5 mm to 20 mm).